The mother of a missing RAF Honington serviceman has pleaded for anyone who may have seen him to come forward. Corrie McKeague, 23, disappeared nine days ago after going out for the evening with friends. He was last seen on CCTV walking alone eating fast food in Bury St Edmunds, Suffolk, in the early hours of September 24. His mother Nicola Urquhart, from Dunfermline in Scotland (pictured), has issued a public appeal in Bury St Edmunds, for anyone with information about where her son may be to contact police. 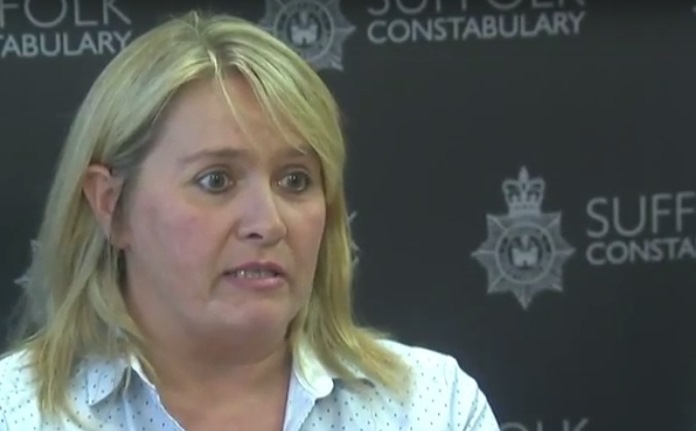 "My son has disappeared - so somebody please, if anyone knows anything, get in touch, get in touch with Suffolk Police. "I don't want this to be a story about Corrie, what kind of person he is, it's about finding him." Mrs Urquhart said her son would "never, never" be out of contact with his family for so long. He had spoken to his brother four times the day before he went missing. "This is not Corrie, he would not do this out of choice,'' she continued. Mrs Urquhart praised the police, the RAF and other search teams for their "fantastic" work. She asked Suffolk residents to check their gardens and said her son may have decided to "have a sleep" before making his way home. "Check your gardens, check your own properties please, but leave the proper searching to the police and people who know what they are doing. He is a good-looking lad at three in the morning walking around in a pink shirt... he is easily identifiable." Mr McKeague, a gunner in Number Two Squadron, based at Honington, has been in the RAF for three years and "loves" his work, Mrs Urquhart added. "The RAF are a family and they really do look after their own, and that's something that I really do want to stress. The boys that were with him are not responsible for Corrie. Corrie does the same thing every time he goes out. Once he goes out he is an absolute creature of habit. He will leave absolutely on his own, that's not unusual. He will go and get food and if he has to lay down and have a sleep before he goes home then he will. Nothing in his behaviour was even remotely unusual and the boys that he was with would not have been able to stop him from doing that. Because that's what he does."